Mu 1 opioid receptor (OPRM1) is a pharmacodynamic receptor that is partly responsible for opioid effectiveness. OPRM1 is most commonly associated with pain sensitivity, substance dependence, and abuse. The most analyzed genetic variant in the pain field, known as c.118A>G, has shown an association with opioid effectiveness, but the correlation is small and not always replicated in studies. The c.118A>G variant has also shown a correlation with naltrexone (Vivitrol®) efficacy in the treatment of alcoholism and addiction risk to opioids. Genetic variant tested for OPRM1 is c.118A>G. Patients beginning naltrexone treatment for alcohol dependence would be good candidates for OPRM1 testing. Testing can also help predict opioid response and dose requirements. In patients of Asian descent, testing can help assess opioid addiction risk. 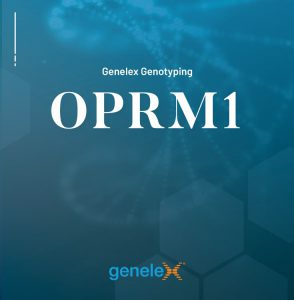 Check with your insurance provider to see if OPRM1 genotyping is covered. The CPT code for OPRM1 testing is 81479 (provided for guidance only).